Supported by neuroscience research, mindfulness practice has demonstrated its ability to ease stress, control anxiety and depression, and improve cognition, focus, and memory. As its reach and influence has increased, mindfulness has raised fundamental questions about its role in therapy. How do these modalities fit together? What might mindfulness add to psychological treatment? What might it tell us about who we are underneath it all? 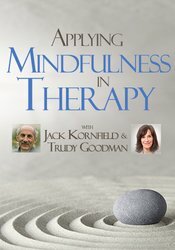 Through story, clinical examples, and experiential practice, leading experts Jack Kornfield and Trudy Goodman workshop will explore the gifts, meanings, and new conundrums of the practice of mindfulness and loving awareness for clients. Discover how to truly integrate psychotherapy and mindfulness practices to help heal your clients’ traumas. *Please note this is the same content as All Together Now at the 2018 Psychotherapy Networker Symposium, you cannot receive self-study credit for this program if you have already attended the live workshop. Multi-disc DVD recording with electronic instructions. Articulate methods by which meditation can be integrated with psychotherapy practices to improve clinical outcomes. Determine the clinical implications of secondary trauma on the therapist and identify simple yet effective meditation interventions to alleviate symptoms of secondary traumas and improve the therapeutic relationship. Trudy Goodman, PhD, founder of Insight LA, is a psychotherapist and senior teacher in Zen and mindfulness traditions. She cofounded the nation’s first Institute for Meditation and Psychotherapy in Cambridge, MA, and teaches worldwide. Financial: Trudy Goodman is director of InsightLA. She is an author for Guilford Press and receives royalties. Non-financial: Trudy Goodman has no relevant non-financial relationship to disclose. *PLEASE NOTE: This is the same content as All Together Now: Mindfulness, Psychotherapy, Identity, and Love at the 2018 Psychotherapy Networker Symposium, you cannot receive self-study credit for this program if you have already attended the live workshop.